I study one of the most profound cultural changes of the 20th century: the rise of casual dress. I study casual dress as it evolved on the beaches of Miami. I study casual dress as worn by the Black Panthers and by Princeton undergraduates. As a professor, I teach seminars on material culture and direct graduate students as they research and curate costume exhibitions, but my bread-and-butter as a scholar is the “why” and “when” our sartorial standards went from collared to comfortable. I happen to own 17 pairs of sweatpants, but I am a convert to casual. As a teen, I scoffed at the wrinkled khakis of my high-school colleagues and scoured the thrift stores of central Pennsylvania in search of the most non-casual clothes I could find—wasp-waist wool dresses, opera gloves, and evening bags. By my mid-20s, I realized I no longer wanted to pry my 6-foot-tall body into uncomfortable clothes and stay in them for hours. While my Clergerie-clad best friend chased down taxis and potential husbands in 3-inch heels, I chose cowboy boots and a pair of overalls that same friend said made me look like an oversized baby. For me, casual is not the opposite of formal. It is the opposite of confined. As Americans, our casual style uniformly stresses comfort and practicality—two words that have gotten little attention in the history of fashion, but have transformed how we live. 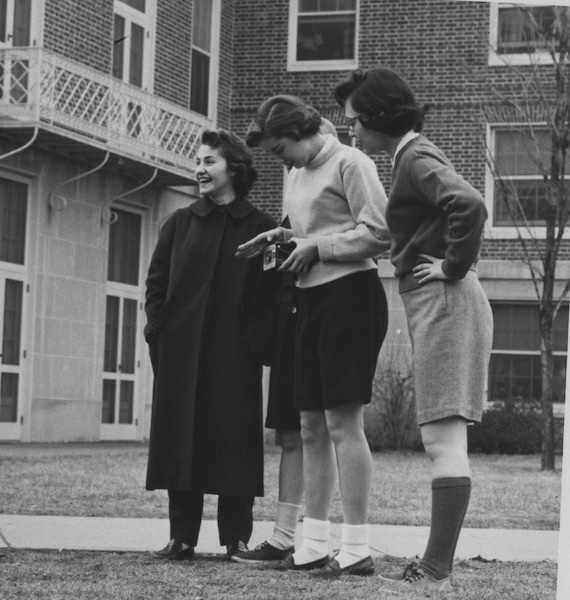 A hundred years ago, the closest thing to casual was sportswear—knitted golf dresses, tweed blazers, and oxford shoes. But as the century progressed, casual came to encompass everything from worker’s garb (jeans and lumberman jackets) to army uniforms (again with the khakis). Americans’ quest for a low-key style has stomped on entire industries: millinery, hosiery, eveningwear, fur, and the list goes on. It has infiltrated every hour of the day and every space from the boardroom to the classroom to the courtroom. Americans dress casual. Why? Because clothes are freedom—freedom to choose how we present ourselves to the world; freedom to blur the lines between man and woman, old and young, rich and poor. The rise of casual style directly undermined millennia-old rules that dictated noticeable luxury for the rich and functioning work clothes for the poor. Until a little more than a century ago, there were very few ways to disguise your social class. You wore it—literally—on your sleeve. Today, CEOs wear sandals to work and white suburban kids tweak their L.A. Raiders hat a little too far to the side. Compliments of global capitalism, the clothing market is flooded with options to mix-and-match to create a personal style. Despite the diversity of choice, so many of us tend towards the middle—that vast, beige zone between Jamie Foxx and the girl who wears pajama bottoms on the plane. Casual clothes are the uniform of the American middle class. Just go to Old Navy. There—and at The Gap, Eddie Bauer, Lands’ End, T.J. Maxx, and countless others—t-shirts, sweaters, jeans, sports shoes, and wrinkle-free shirts make “middle classness” available to anyone who choses to put it on. And in America, nearly everyone wants to put it on because nearly everyone considers himself or herself to be middle class. The “why” behind casual dress is a hand-clappingly perfect demonstration of fashion theorist Malcolm Barnard’s idea that clothing does not reflect personal identity but actually constitutes it. As one of my students put it, “So, it’s not like ‘Hey, I’m a hipster and then I buy skinny jeans and get a haphazard haircut,’ but more like in becoming a hipster, I get the jeans and the haircut.” Yes. In wearing cargo shorts, polo shirts, New Balance sneakers, and baseball hats, we are “living out” our personal identifications as a middle-class Americans. Our country’s casual style is America’s calling card around the world—where people then make it their own. It is witnessed by the young boy on the Ivory Coast wearing a Steelers jersey and in the price of Levi’s on the black market in Russia. Street styles in Tokyo harken the campuses of Harvard and Yale in the 1950s—tweed sports coats paired with t-shirts and saddle shoes. Casual is diverse and casual is ever- changing, but casual was made in America. As far as the “when” of our turn to casual, three major milestones mark the path. First, the introduction of sportswear into the American wardrobe in the late 1910s and early 1920s redefined when and where certain clothes could be worn. The tweed, belted Norfolk suits (complete with knickers and two-tone brogues) of the Jazz Age seem so formal by our “flip-flops-can-be-worn-everyday” mentality, but these garments were truly revolutionary in their time. As were the sweater sets and gored skirts worn by women. The trend towards casual flowed in one direction, as one period observer noted in a 1922 article in the San Francisco Call and Post: “Once a woman has known the joys and comfort of unrestricted movement, she will be very loath to go back to trailing cumbersome skirts.” The mass acceptance of sportswear coincided with the consolidation of the American fashion industry, which had previously been disjunctive and highly inefficient. By the end of the 1920s, centralized firms produced designs, worked with manufacturers across the country, and marketed specific kinds of garments to specific demographics. A second milestone toward casual was the introduction of shorts into the American wardrobe. A flare-up in the popularity of bicycling in the late 1920s brought about a need for culottes (looks like a skirt but is actually shorts) and actual shorts—usually to the top of the knee and made of cotton or rayon. Shorts remained time-and-place specific for women (gardening, exercising, and hiking), until the Bermuda shorts craze of the late 1940s, when women turned plaid wool shorts into legit fashion and began experimenting with length. At all-male Dartmouth College in May 1930, the editors of the student paper challenged their readers to “bring forth your treasured possession—be it tailored to fit or old flannels delegged” so that the men could “lounge forth to the supreme pleasure of complete leg freedom.” The students listened. 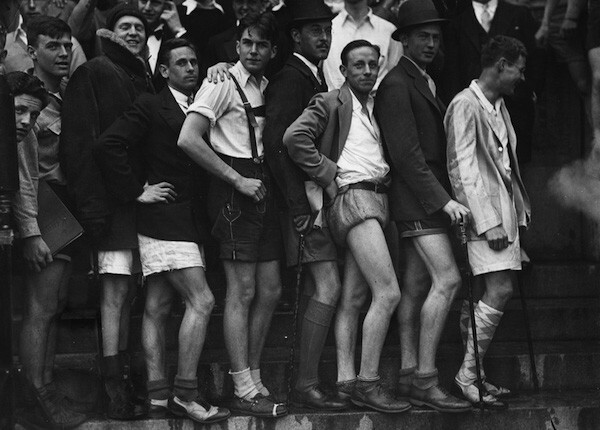 The Shorts Protest of 1930 brought out more than 600 students in old basketball uniforms, tweed walking shorts, and newly minted cutoffs, and introduced shorts into the American man’s wardrobe. With a higher tolerance for different genres of dress and a newfound appreciation for non-constraining garments, Americans moved into the 1950s with more options to self-create than ever before. Fundamental to this freedom—apart from the suburban department store boom and the onslaught of media (magazines, television, film)—is a “unisexing” of our wardrobe, a third milestone on our quest to go casual. While bohemian types wore pants in the 1910s and 1920s, women really didn’t wear them until the 1930s, and it was not until the early 1950s that pants made it mainstream. There were still discussions and regulations about women in pants well into the 1960s. To dress casual is quintessentially to dress as an American and to live, or to dream of living, fast and loose and carefree. I’ve devoted the past decade of my life trying to understand “why” and “when” we started dressing this way—and I’ve come to many conclusions. But for all the hours and articles, I’ve long known why I dress casual. It feels good. is a scholar, public historian, and teacher. She is the author of Dress Casual: How College Kids Redefined American Style (UNC Press, 2014) and has published articles in The Atlantic and Harper’s Bazaar, among other publications. For more information, visit deirdreclemente.com. *Lead photo courtesy of the University of Wisconsin-Madison Archives. Interior photos courtesy of the Rauner Library, Dartmouth College, and the Penn State University Archives, Pennsylvania State University Libraries.